The must visit is The Citadel which was awarded World Heritage status in 1993. The defining legacy of the first Emperor, Gia Long, the immense complex sits behind 10km perimeter walls. The equivalent of a small village, the buildings within the walls were arranged in three concentric enclosures. Today very little remains of the outer enclosure except for the impressive three-storey flag tower which oversees the main Ngo Mon Gate. Originally consisting of 148 separate buildings (only 20 remain today) a detailed diorama indicates just how magnificent it would have been. Green and yellow tiled roofs covering red and gold lacquered oriental styled houses located in private gardens. Imposing palaces nestled amongst verdant parks and contemplative lotus ponds. The Thai Hoa Palace’s glorious throne room is supported by 80 red lacquered pillars. Behind sits the restored barracks of the mandarin military. The royal theatre welcomes audiences sitting on throne like seats watching musicians play on a crimson dais evoking former times. 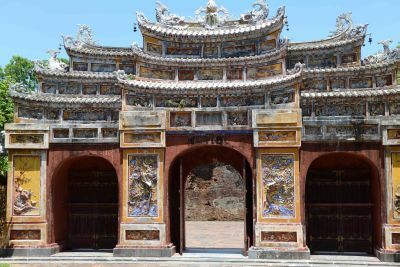 Ancestor worship is still today a major feature of Vietnamese culture and at the Ancestral Alters are a collection of three wooden temple-like structures dedicated to the Nguyen emperors containing elaborate gilding, lacquering and intricate wood work. Inside The Mieu dynastic temple a collection of shrines carries an image of each emperor, whilst in the courtyard, elaborately carved with mountain, river, animal and landscape scenes, bronze urns weighing up to 2600kg commemorate their reign. However the elaborate mausoleums mirroring the emperors’ characters best reflect the excess of the dynasty. Selecting the site of the mausoleum was as important as the structures themselves. Cosmologists were charged with choosing the most auspicious location, this sometimes took years. Khai Dinh’s mausoleum is probably the most bewildering. Highly ornamental this emperor was somewhat glitzy in his styling and is said to have dressed in fairy lights as he wandered around his palace. Unsurprisingly his mausoleum is one of the most elaborate with every surface elaborately decorated with gild, lacquer, crystal and porcelain mosaic dragons, symbols and icons. Perched upon a wooded hill the mausoleum is guarded at its base by a splendid collection of mandarin military and elephant sculptures. Emperor Minh Mang on the other hand opted for a landscaped feel. Set in 15 hectares and reflecting classical, Chinese, symmetrical planning the tomb mound is reached along a processional pathway leading through beautiful temples and a set of connected lakes bringing a sense of serenity and peace to this particular resting place. 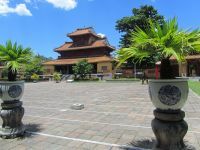 Sitting on a breezy, pine shaded terrace, above the vistas of The Perfume River the Thien Mu Pagoda was founded in 1601 and is an oasis of calm. The Buddhist temples sit amongst the most beautiful bonsai gardens and if your timing is right you can witness one of the student monks’ ceremonies. It is perhaps best known for its status as a centre of opposition to colonialism and was made famous when resident monk the Venerable Thich Quang Duc burned himself to death in Saigon in protest against the oppression of Buddhism by President Diem. There is a shrine to the Duc which features the disturbing media photo of the self-immolation, incongruously sitting alongside the Austin car in which he drove to Saigon. 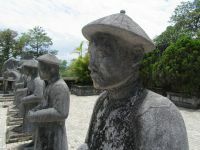 Hue has an excellent selection of accommodation to offer from the basic back packers’ hostel through to 5-star resorts. About 20 minutes’ drive from the centre sits the sumptuous Ana Mandara Hotel luxury beach resort which offers visitors the best of all worlds, Vietnamese dining, airy spa, easy access to Hue, a fabulous beach of golden sand lapped by the calm waters of the South China Sea. Sitting in nearly three hectares of perfectly manicured gardens guests can select from a variety of rooms ranging from deluxe through to pool villas. The beach villas are the best option offering a bedroom, sitting room and expansive bathroom, which is complemented by my personal favourite, an outside walled shower fringed with bamboo and starry night canopy. The pool bar provides a collection of sun-downer options as you watch the local fishing boats heading out for the evening catch or before you dine in Lagoons restaurant which serves up some of the best quality food in Hue, fresh, light Vietnamese dishes feature alongside international choices. If a day on one of the most peaceful Vietnamese beaches isn’t quite relaxing enough then visit La Cochinchine Spa and select from an array of Asian influenced massages, body treatments, facials or pampering collections. The therapists may look tiny but they are fiercely strong masseurs. For a light lunch take a short stroll along Ana Mandara’s Thuan An Beach to one of the little beach shacks. Squid hang drying from wooden poles, plastic tubs full of aerated salt water are laden with crabs, tiger prawns, fish and even moray eel. Menu choice is straight forward, you just point to what you fancy and the chef will confirm how it should be cooked. The hotel can arrange guided tours of Hue, celebratory events, weddings, and has a full conference centre facility for groups of up to 300 people. Children are welcome too.